By Lee Stanbury, Experienced Swim Coach with 25 years + experience. The KayakPro SwimFast unit its self is extremely well made, with a bench that can be suited for ALL ages and Heights, the hand paddles do fit all sizes of swimmers, the light front part of the paddle is great for a focus on catch phases, in ALL the strokes. As a coach technical feedback can be a highly important part of swimming training, standing close to your swimmer will allow great feedback using the swim fast , high elbow, early vertical form and front end of stroke, many different options, all strokes and technical areas..
With a Reactive Workbench that creates a good torso roll, this is great for the correct shoulder angles, good balance in ALL strokes is key. The patented “Catch” on SwimFast is extraordinarily smooth with no catch delay. The SwimFast also comes with extras like the Halo SwimBench Template.. Available through a cooperative effort between SwimFast and the HALO Swim Bench Company. The HALO’s patented templates guides the swimmer into a crucial phase early in each stroke cycle called “High Elbow Catch” or “Early Vertical Forearm” in particular like this , Early Vertical Forearm, OR EVF as its also known as is a keep composite in swimmer speed and development..
Adjustable, Variable, delay – proof catch, with soft catch-entry and water feel. The SwimFast Ergometer has a patented recoil technology that ensures identical resistance each side with instantly connected return at whatever tempo you choose. The Swim Fast has a Removable and adjustable head support. It will support the athlete’s head so that the neck and supporting muscles are not working whilst training on SwimFast, it actually works quite well, and adds just that little bit more support. Extendable Swim bench which compresses after work-out to minimize space requirement when not in use. E-Z roll wheels allow the SwimFast to be moved from location to location. The SwimFast can be stored vertically, this is great , it basically means that the unit can placed anywhere – tucked away on the poolside and then pulled out for training sessions. 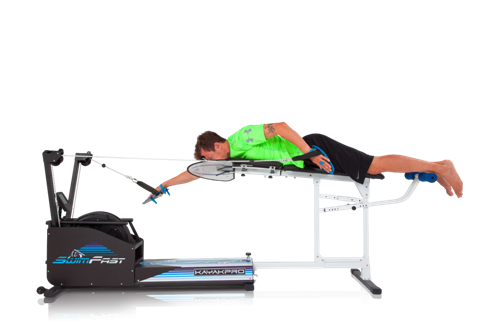 The SwimFast on-board console comes included with your SwimFast Ergometer. The on-board console is able to receive input of the performing athlete’s weight. It is important to input the user’s weight in order to ensure that the data output for each SwimFast Ergometer is specific to the weight of the athlete that is using it. Key sessions can be achieved using the console, sprint sets and distance sets can be done using the console, interval sets that are so key to a swimmers training and fitness.